LANSING –The Michigan National Guard is spending $1.5 million on two new machines to generate electricity from wind at Camp Grayling near Grayling and the Fort Custer Training Center near Battle Creek. 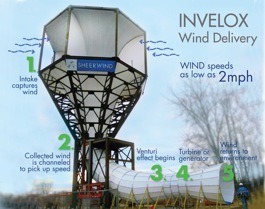 Unlike traditional windmills, the system captures wind from all directions, concentrating and accelerating it before sending it through a turbine on the ground, according to its designer, Sheerwind Co.
Design of the wind funnels to be installed at Camp Grayling and Fort Custer. Credit: Sheerwind Co. The Minnesota-based company calls the design INVELOX, which stands for INcreased VELocity. Sheerwind says the system generates six times more electrical energy than conventional wind turbines and can work at wind speeds as low as 2 mph. And it’s cheaper to build and operate. Some wind power experts say that’s too good to be true, however. Barnard wrote in a blog that INVOLEX should be compared with a wind turbine with the same swept area and height as INVOLEX. Instead, INVOLEX was compared with a wind turbine that is as small as the one installed inside it and that is not as high, he said. “Pretty much any device will look good if you make that comparison, even if it’s terribly inefficient. It’s comparing watermelon to grapes,” Barnard said. However, Carla Scholz, Sheerwind’s vice president of marketing & communications, disputed Barnard’s criticism and said the company wouldn’t comment on it. And Michael Stone, the assistant adjutant general for installations with Michigan Army National Guard, said the Michigan Guard was happy to test the wind funnels and he’s confident that it was a good investment. The funding comes from the National Guard Bureau, and construction will be done by Ripman Construction Co. of St. Helen in Roscommon County. Stone said he and his chief engineer have been looking for ways to increase the proportion of renewable energy used by the Guard. The Michigan National Guard wants to increase the percent of renewable energy that it uses to 25 percent by 2020, he said, “We are working with the community partners and utility companies to try to find creative, cost-effective ways to get there. Besides making the Guard more sustainable and environmentally friendly, such projects would also increase the Guard’s energy security, said Stone. Dulles Copedge, an energy adviser to the Michigan Guard, said Sheerwind is doing wind studies as part of the engineering design. Construction could start by next spring. Both Copedge and Stone predicted that if INVOLEX works well, more wind funnels will be installed in Michigan and nationwide. A media relations representative for the National Renewable Energy Laboratory of the U.S. Department of Energy that studies renewable energy generation, said the organization hasn’t tested that wind model and isn’t familiar with it. LANSING – The idea of graveyard as park, with landscaping designed to aid contemplation and to encourage the illusion that the visitor had left the regular world behind, is a surprisingly modern one. In fact, in this country it goes back only to the 1830s, says Thomas Dilley, author of “The Art of Memory: Historic Cemeteries of Grand Rapids, Michigan,” a new book published by Wayne State University Press ($39.99).